I have always loved using a facial exfoliant because I feel that my skin needs an occasional deeper clean to remove dead skin cells and to reinvigorate my skin. But not all exfoliants are made the same! 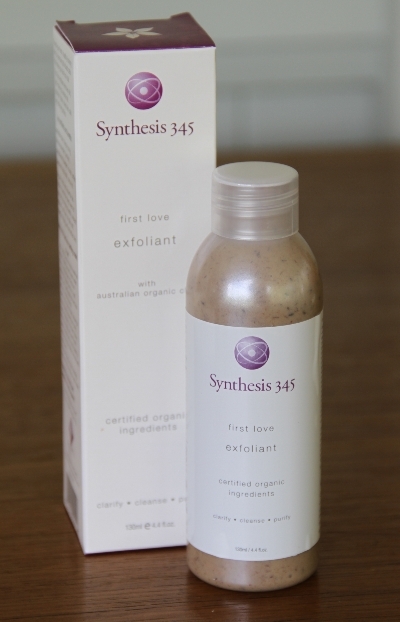 What makes a good exfoliant for me is the consistency of the exfoliating particles and I am happy to say that the First Love Exfoliant from Synthesis 345 is the first natural and organic exfoliant that I have tried that has the perfect consistency! 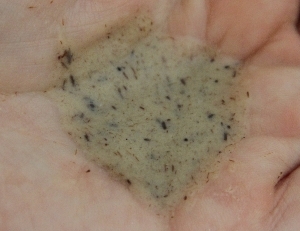 This great product has 3 special ingredients to exfoliate the skin. Australian yellow clay, sandalwood powder and bamboo which gives the more firm exfoliating action. You can see the bamboo in the below picture and it is surprisingly soft but firm therefore it is not scratchy or rough on the skin. After using this exfoliant my skin immediately felt soft and smoother and it also gave a nice toning effect on the skin. It also contains rose hip oil and aloe vera which helps soothe the skin. Another thing I like about this product is the lovely rose smell. It is not overbearing like some rose based products but it is quite uplifting. This product can also be used as a clarifying mask by leaving on for 10 minutes before rinsing off but I just like to use it as an exfoliant cleaner a couple of times per week. Synthesis 345 is an Australian owned and made brand and has a strong focus on sustainability and fair trade. All their products are free from synthetics, irritants, GMO’s, formaldehyde producing preservatives and non-naturally derived ingredients. If you are looking for an effective natural exfoliant that actually feels like it is doing something then I definitely recommend you try this one. Australian organic yellow clay, tea tree powder, sandalwood powder, bamboo fine, hydrosol of lavender and orange, aqueous botanical blend of chamomile, decyl glucoside, aloe vera, Olioyl hydrolysed wheat protein, cold pressed rose hip oil, natural vegetable glycerin, carrageenum gum, neroli oil, jasmine oil, bergamot oil, rose oil, sandalwood oil, dehydroacetic acid and benzyl alcohol (natural preservative). This product was given for review consideration by Synthesis 345. All product reviews and honest opinions on this site are solely that of my own and I am not endorsed or paid for this review.